On Feb 10th (strategically timed before Valentine’s Day), the RJ Confessions Facebook page was created, and has garnered more than 3500 likes and 7000 people talking about it. For those who have been living under their Math tutorial booklet, this is the RI Y5 and 6 equivalent of an online anonymous confessions trend that has been all over everyone’s news feed. The first page that sparked it all off was probably the NUS Confessions Page, which spawned a slew of pages for both undergrad and tertiary student communities such as NTU, SMU, and ACSI, with even a little-sibling Raffles Confessions meant for the Y1-4 side and RGS students. 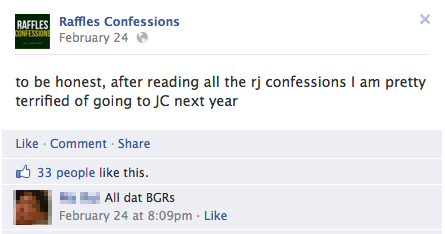 “All dat BGRs”, indeed…90% of all posts on the RJ Confessions page are related to infatuation, relationships or love. The longest ever post was a 741-word essay (word count included) on BGR in JC. Trivial, shocking, or funny; encouraging, honest, or thought-provoking. The wide range of ‘confessions’ that appear on the constantly updated RJ Confessions page could be seen as testament to a unique Rafflesian creativity, humor, and expression (or perhaps repression). They include everything from actual confessions and anecdotes on school life to rants, moralistic policing and even original poetry! Not to forget the bread and butter of any confession page: the romantic confessions, and their counterfeit counterparts: the ‘troll’ confessions. These probably number as many as the genuine ones, and are done for laughs or to embarrass friends. A site that sees such heavy traffic and volume cannot be single-handedly maintained. But who are the genii behind this source of entertainment (or disdain) for thousands of Rafflesians and non-Rafflesians alike? Admins 1, 2, 3, 4 and 5 of course! You know them by their comments, now here’s a chance to find out more about how they operate, and what they think of the phenomenon itself. Raffles Press presents our exclusive interview with the RJ Confessions Page admins. Which batch(es) are you from? Tell us more about yourselves! We will reveal it when the time is right. Admin 1 is a guy, Admins 2 and 5 are girls, Admins 3 and 4 are currently in NS. Do any of your friends know who you are, or do you keep your identity as secret as super-heroes? Only a few of Admin1’s friends know. How has the frequency of confession submissions been since the page’s opening? Do you think this phenomenon will die down? We don’t really measure the frequency, but yes the frequency has been decreasing, but barely. Admin 2 thinks this phenomenon is just a fad that will die down as everyone starts mugging, but Admin 1 thinks then, this page will still be used but to rant about different matters such as PW. What inspired you to create this page? What motivates you to keep it running? Well Admin 1 does this page really just to give other Rafflesians an avenue to voice out concerns they’re afraid of voicing out usually, because Admin 1 has been hoping for something like this for a long time but since no one did it, he got inspired by the recent confessions trend in local universities and decided to create such a page. We keep it running because we are sure there will be other Rafflesians like Admin 1 out there who want this page. We’ll do it for as long as people continue to support us and use this page. How often do you check/post stuff? How much time do you spend sifting through submissions? How do you find the time?! We do it any time and all the time – we use time turners. You sometimes add in snide, humorous or corrective comments at the end of some posts; for example, pointing out the other side of an extreme opinion. Do you see yourselves as neutral facilitators, or moralistic arbiters of the RJ confessions community? Nope, not at all, we’re just adding our own comments because sometimes we just feel that something needs to be said about the confession; it’s quite entertaining too. What is your censorship policy? How many submissions do you reject daily? Well we reject all posts containing obvious names and posts containing vulgarities or highly defamatory ones, especially if they are ungrounded accusations. Different admins have different criteria. Admin 2 generally does not like posts about love whereas Admin 1 favors those posts. Generally nowadays we hardly reject submissions because people are starting to learn what is acceptable and what is not. Yes, many people reminded Admin 1 of that at the start, and yes we do bear that in mind. A wet blanket or a prudent warning? We’ll find out eventually. Is it…True, Helpful, Inspiring, Necessary, Kind? What do you think is the risk of ‘offensive’ or ‘disagreeable’ content being posted? What if the school requests that the page be shut down? Honestly, I think THINK isn’t really Necessary, because if all those conditions had to be met, then 90% of RJ Confessions posts would never have existed. I think only the T aspect of THINK is important. I think the risk of such acts is already amply covered in newspapers/GP lessons, but I still think it would only have, at most, a short term impact on our school’s reputation. I don’t think I will agree with the school if they asked me to shut this page down; there is little they can do to force me into doing it too. What are some examples of the “ugliest” confessions you receive? Well, basically there were vivid descriptions of sexual fantasies. I certainly hope those were trolls. In your opinion, do you think RJ Confessions has debunked or reinforced Rafflesian stereotypes in the public eye? I doubt so. Some things are too ingrained for a few comments on the Internet. To change such stereotypes requires the long-term co-operation of all Rafflesians – past, present and future. Wouldn’t a Twitter feed be well-suited to posting confessions? We think the Facebook page is enough on our plates as it is. Indeed, they do have a lot on their plates – these admins have filtered and posted a whopping 2400 entries to date, excluding those that are not aligned with their censorship policy, as well as many romantic confessions they deemed not interesting enough. And of course, the most famous one of all, the “payphone” confession! Too long to be posted here, it has garnered more than 3300 likes and has even been featured on 9GAG Singapore! RJ Confessions is not just about infatuated declarations and unrequited crushes. It’s about freedom of speech (though some might disagree, given the unchecked moderating power of the Admins), and the boundaries our community is willing to challenge. It’s about Rafflesian creativity and humor at its best (and worst) – for many students this may be a new opportunity to try their hand at creative writing, something they may not get the chance to do in the daily grind of academic life. It’s about Rafflesians helping each other out – either by sharing inspiration or dispensing experienced advice; a support network of individuals united by common experiences. RJ Confessions also plays a crucial role as a space for Rafflesians to talk about and deal with stereotypes within our community (albeit in an open platform). Since its inception, the page has seen more than 20 posts that denounce, qualify, reinforce or discuss Rafflesian stereotypes, including contributions from non-Rafflesians or members of the public. It can also be an avenue for socially marginalized groups to speak up; for example, there have been numerous sexual-minority confessions that talk about the challenges they face being ‘open’ or ‘closed’ amongst peers about their sexual identities, calling for greater tolerance and acceptance. It is easy to dismiss this page as frivolous or trivial, a passing phenomenon that will eventually fade. Yet, more than one month on, it is still going relatively strong; perhaps its enduring appeal lies beyond the anonymity it grants and the audience response it guarantees. As the quote on the pillar in the library says, the Rafflesian Spirit is “…that which transcends generations to bind Rafflesians to work as one to strive towards a better age”. RJ Confessions’ continued relevance may be in the niche that it fulfills – allowing Rafflesians across batches and from all facets of the rich RI(JC) experience to connect. Ultimately, beyond functioning as the sole cross-experiential and cross-generational platform of discourse for Rafflesians to engage in, the roles that RJ Confessions can embody will be defined by the discernment and ingenuity of individual Rafflesians. As RI’s no-nonsense discipline master, Mr Tan Boon Poh is known for the poker face expression that accompanies his interactions with students, from doling out lame jokes and white slips to reciting the infamous THINK. But if “Hurry up, come in!” or “Eh, where’s your badge?” is all you remember of him, you might have to tweak that opinion soon. In today's Teacher Feature, we find out more about our stoic DM's mysterious life as a RI's head rule enforcer and his marathon pursuits.